NPR correspondents are taking the historic Grand Trunk Road from the Bay of Bengal in the east to the Hindu Kush mountains in the west, across the Indian subcontinent. They talk about life along the route. This is the first post from when they arrived in Pakistan, last month. 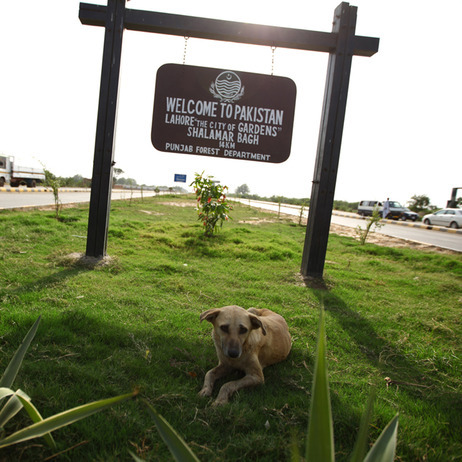 We hope to reproduce, over the next few days, here on PTH, their thoughts and impressions on the journey through Pakistan. Will I find what I left behind? Will it find me as I move away from its tranquillity? The adventures of distant times of nature and mankind! Bashir Ahmed Member Scottish Parliament. I first saw Bashir Ahmed on UK’s Pakistani channel (Pakistani channel was a result of the split between Pakistani TV Asia and Zee TV Europe). Second time I saw Bashir Ahmed was on BBC Parliament channel giving a speech to Scottish Parliament about Pakistan and its economy. A few days ago, I saw his Picture on a News website with a notice of his death and the news item that his seat in parliament has been filled by female deputy from his party SNP. Bashir Ahmad MSP, politician and businessman, born 12 February 1940; died 6 February 2009 of a sudden heart failure. In 2007 Bashir Ahmed became the first Asian (Pakistani) and first Muslim member of the Scottish Parliament when he was elected one of the four regional members representing city of Glasgow. Bashir Ahmad was born in Punjab, and in 1961 moved to Scotland. He recalled arriving at Glasgow airport (Sadly in June 2007 Muslim-Indian/Iraqi terrorists attacked Glasgow airport with a home-made car bomb) from Pakistan not speaking a word of English. A bus driver went off his route to help Bashir to his house. This was Scottish hospitality for Bashir, when Americans were suffering racial segregation on the buses. He worked initially as a bus conductor before setting up in business, eventually owning shops, restaurants and a hotel. He also co-founded the Pakistan Welfare Organisation. Bashir Ahmad joined Scottish National Party in 1995 and set up the group Scots Asians for Independence from UK. In a speech at the SNP’s conference he told Scots: “It’s not where we came from that’s important, it’s where we’re going together.” The work Bashir Ahmad put in making Scotland perhaps the only place in Europe where multiculturalism isn’t a dirty word, meant that across the political spectrum there is an acceptance that all come to the table of Scotland with different badges of identities, cultures and faiths – but sit round it in ease and with respect. Pakistani business people have become multi-millionaires and British Members of Parliament (In 1997 Mr. Mohammed Sarwar -Labour Party- became the First Pakistani MP in UK also from Glasgow. Currently six Pakistanis and one Kashmiri are Members of British Parliament and House of lords). Bashir Ahmad joined the SNP national executive committee in 1998 and when in 1999 Scottish parliament was constituted he was ninth on the SNP’s Glasgow list for the first Scottish parliamentary elections. In 2003 he was elected to represent the Pollokshields East(an area famous for Pakistani restaurants) of Glasgow city council, becoming the SNP’s first Asian (Pakistani) councillor. In 2007 Bashir Ahmed was elected an MSP. He took his seat at Holyrood wearing traditional Pakistani dress and swore his oath in both English and Urdu (like the Nobel Prize acceptance speech by Dr Abdu-Salam or Dr Kamal Qureshi -the Member of Parliament Denmark- audience with Queen Margarette). He served on various cross-party groups, for human rights and civil liberties, for carers, for older people, age and ageing, and the group for Tartan(Scotland national costume male kilt which looks like a female skirt) Day. He took his Muslim faith and Pakistani culture seriously. A number of people tell how they had been touched by his warmth and kindness. His generosity did not have barriers of caste, race or religion. He helped many deserving Pakistani students and workers in times of need without expectation of rewards or gratitude. Will we need to close the door to Pakistan’s dispossessed? Comments Off on Will we need to close the door to Pakistan’s dispossessed?